Birthday surprise for manager of Cloudy2Clear Windows Dumfries! 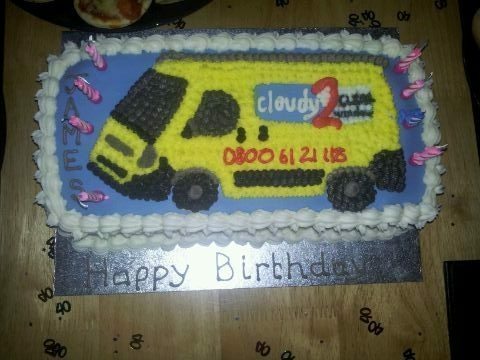 Cloudy2Clear Dumfries say you can have your cake and eat it! James Watret, manager of Cloudy2Clear Dumfries and Carlisle was delighted to receive an extra special present for his birthday recently, his very own Cloudy2Clear birthday cake! James has been running the Dumfries and Carlisle branch for 4 years now and the business is going from strength to strength, ‘I get an awful lot of recommendations from people I’ve done work for and their family and friends. We’re very straight with people and I think they appreciate that. I would also say that since starting I must have saved people in the area tens if not hundreds of thousands of pounds when they realise that they don’t need a whole new window and that I can just replace the glass. It’s a great feeling being in a business that can offer that to people and it gives you a great feeling of job satisfaction and, it muct be said, personal prie. That must rub off on the family or they wouldn’t have done me the cake!